The health of the environment is a matter of life and food. The beauty of the natural world and the life that sustains it has immense intrinsic value. It is worth preserving for its own sake, but in the end, human survival will take precedence over preserving natural systems. The two are not separate, however. Human survival is directly linked to the health of the planet. The effects of environmental changes are nowhere more apparent or more critical than in the food supply. 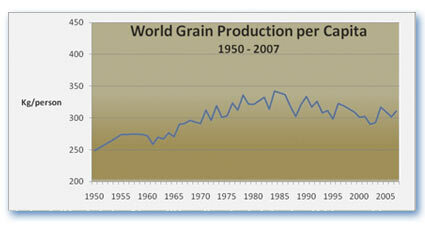 According to data from the U.S. Department of Agriculture, world grain production peaked in 1985. Grain is the fundamental source of calories for humans and many domestic animals. As grain supplies shrink the availability of other sources of food and protein also become more expensive and eventually lead to scarcity. We have been living on the fruits of the “Green Revolution”, but fail to realize that the increase in crop yields that resulted from that work is unlikely to continue. Since 2006 China and India have been able to increase production, but the overall trend is flat. The best evidence that this is true is the graph above combined with the increase in grain prices. 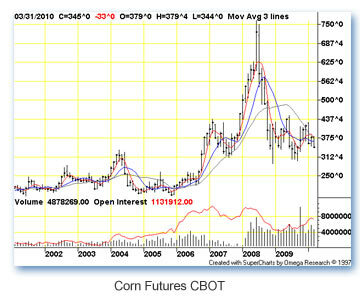 Corn prices on the CBOT (Chicago Board of Trade) have ranged from $1.35/bushel in 1971 to $2.00 at the low in 2002 to the present price of $4.10 for September delivery 2010. Some of this price rise is caused by the misguided program to convert corn to alcohol, but the underlying cause is a worldwide decrease in production. There are a number of reasons for this which are more thoroughly documented by other sources, but in brief. 1. Loss of crop land to desertification. This is especially severe in Africa and Northern China. The annual of expansion of land desertification in China increased from 1,600 km2 in the 1970s to 2,100km2 during the 1980s and is still increasing. 2. Exhaustion of irrigation water or diversion of water to cities. Although total irrigated land continues to increase, the aquifers in many areas are being over pumped. Irrigated land is being abandoned because of salt build up. Northern India is one area especially hard hit. 3. Climate change, changing rainfall patterns and warmer temperatures will open up new lands for agriculture and shut down others. There will always be a lag before farmers can adapt and develop new crops which tends to reduce total yields. Some regions are predicted to have reduced rainfall which will reduce agricultural potential. For example the IPCC models show a decrease in groundwater recharge by 70% between now and 2050 along the southern rim of the Mediterranean, an area that can little afford increased water stress. 4. Economic Incentives play a role as farmers turn to higher value cash crops. It is a trend that will be self limiting as grain prices rise, but the cost to the family living on a minimal budget is greater hunger. Migration of labor to the cities has resulted in a decrease in double cropping. Some labor intensive practices are only practical on a small scale with a significant amount of manual labor. As rural populations seek work in cities and farms become larger and more mechanized there is often a net decrease in the output per acre despite the use of modern farming techniques.